A well planned and smooth execution makes your idea live; but great marketing makes your idea a SUCCESS! Many great app ideas are developed and then go into the AppStore abyss. Don’t let yours be one of them! 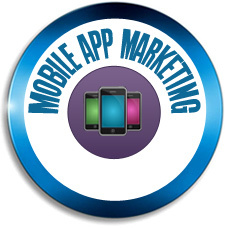 Mobile Marketing is the difference between your app being listed and your app being found. Our experience and success in Mobile Marketing can help your idea reach the potential that you know it has. Our creative, experienced, and technical approach to maximize your ranking on search engines, App Stores, and other unique and effective channels separates you from your competition and makes you stand out and scream "Download Me!". It usually is the last piece of information required to get your app live on the app store – your App Store Product Page. And what happens? You are so excited to see your app live in the store that you slap some copy together with a couple random screen shots of the app and you publish that. But what people forget is that this is the first thing that users see when they discover your app! It is like your app’s homepage and will be the destination for all of your other marketing efforts. This page needs to immediately be compelling and tell the user why they should download your app. There is probably only seconds that you get a user’s attention before they go on to the next app, so it is critical that this page has the right copy, screen shots and keyworded properly to maximize your conversions.